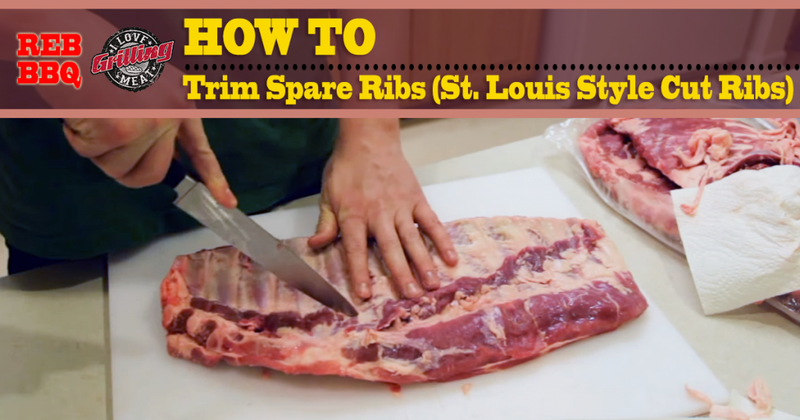 In this video you will learn how to trim spare ribs to get that St. Louis style that you see pitmasters cooking. Watch the video and read the guide below, and do not hesitate to ask any questions you have at our Facebook page or in the video comments. You only need some spare ribs and your sharp knife, so let’s get started! Squaring up the ribs St. Louis style is a fairly straightforward process. Begin by cutting off the end and the “skirt”. You can keep those cuts and cook them together with the ribs: they will be ready about halfway through, and you will be able to taste the progress of the smoke and how the rub is working. Remove the membrane on the bone side. You can separate one part with the back of a spoon, and then tear it off in one or more pieces. Trim the excess fat from the ribs. Spare ribs do not have too much fat to begin with, but if there are any parts that you feel will not render down properly, remove them. The last cut you want to make is separating the rib tips. Find the spot where the bones end, and cut a straight line from one end of the ribs to the other. Your St. Louis style ribs are now ready to cook!